That's a good forced response, with a good subtype too. If we take 1 of his cost to be the response then the skills/icons to cost is decent enough. A solid choice only hurt by the competition at that cost slot. It's only a good forced response if your opponent has the most cards, this makes the card unplayable in some situations. Cost > skill/icons is never good without a really good ability to back it up. At least this has the criminal subtype. This one's weird. He's got the Criminal tag, which is good, but his stats are abysmal. 1) even with bouncing shenanigans or what-not you can achieve parity (+/- one card) at most. Your opponent doesn't have any cards left, you have one card left. That's the "discard dream". Opponent's turn, he draws, is one card up. So even the "final lock-down", when you've got the game under control seems iffy, since you're sacrificing your own hand to do so. 2) in what kind of deck would you put a character like this if not in a hand destruction deck? If you're already making your opponent discard, he's probably at lower hand-size anyway and he becomes flat-out unplayable. As I see it, Syndicate has faaaar too many great 3-drops to put this guy into a deck instead. St.Claire, Naomi, Pan, Clover, oodles. Even if they serve completely different purposes, the Executives conditions are just too bad. I could see the reasoning of a beefy Criminal decked out in icons that has the drawback of maybe making you discard cards, but paying 3 for 2 icons, 2 skill and a forced response that most of the time won't be helpful doesn't make a lot of sense. When I was looking through the Syndicate's Dreamlands cards this morning, many of them seem to share this mechanical trope of giving the opponent cards. 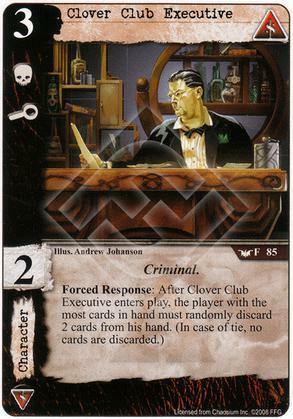 Maybe the idea at the time was to let the opponent draw all those cards, then knock them down to size with Clover Club Executive and Petty Thief? The Syndicate cards that were released during the Dreamlands cycle were all pretty bad. At that time the faction lacked direction and focus. It wasn't until Mr. David Pan arrived that the Syndicate became competitive again. But what does this achieve? You are pretty unlikely to mill your opponent with these mechanics and if you let them draw as much as they discard, they will only be happy to see the stuff being put in their discard pile. But it's like Jhaelen's said, I guess: The Criminal cards of old just are not on the same power level as the more recent ones. There's power level and there's "What's the sense in doing any of this? ", which is the question I think these Syndicate cards beg. I have played against a really fast rush Yog/Syndicate deck with this. Rushing a lot of characters to board and utilizing this from hand and with Twilight Gate the discard 2 random cards from hand did hurt. It is very situational, but I don't think it's That bad you make it out to be if you can make sure the opponent is at the end of the hurt stick.